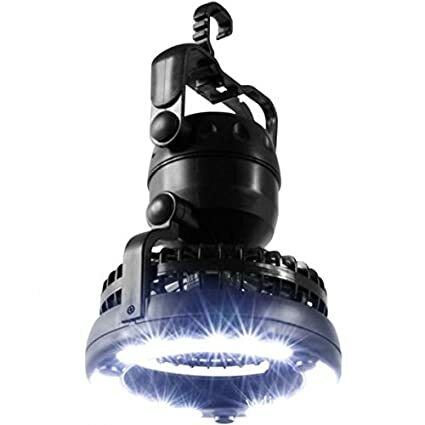 This Portable LED Lantern/Ceiling Fan is back up on Amazon Gold Box Deals. Clam sells a similar Fan/Light Combo for over $20 while Amazon has this generic version for only $10. If you’re looking to add light and heat your shelter more efficiently head over and check this out. This fan will provide up to 37 Hours of light with two D-Cell Batteries! Own and use this LED Light/Fan Combo? Take advantage of this Ice Fishing Deal? Give us your two-cents in the comments below. Posted on April 24, 2018 April 24, 2018 by IFDPosted in Accessories, All DealsTagged Amazon, fan, fan light, ice shelter fan, ice shelter light, ice shelter lighting, lantern, LED, led light, light, light and fan combo, light fan, light fan combo, shelter light, shelter lights.